In a small bowl, whisk together soy sauce, pineapple juice, brown sugar, garlic, ginger, vegetable oil, and water. Set aside. Heat oil in a heavy skillet or wok over high heat. Add snow peas and stir for 45 seconds. Remove to a separate plate. Set aside. In a large bowl, toss together cornstarch and beef, until beef is completely coated and evenly distributed. With tongs, add half the meat mixture and half the scallions to the skillet. Spread out meat as you add it to pan, but do not stir for a good minute. (You want the meat to get as brown as possible in as short amount a time as possible.) Turn meat to the other side and cook for another 30 seconds. Remove to a clean plate. Repeat with other half of meat, allowing pan to get very hot again first. After turning it, add the first plateful of meat, and the snow peas back into the skillet. Stir in sauce and cook until the sauce thickens and coats the beef and caramelize, about 3-5 minutes. Place rice in a bowl and top with veggies. 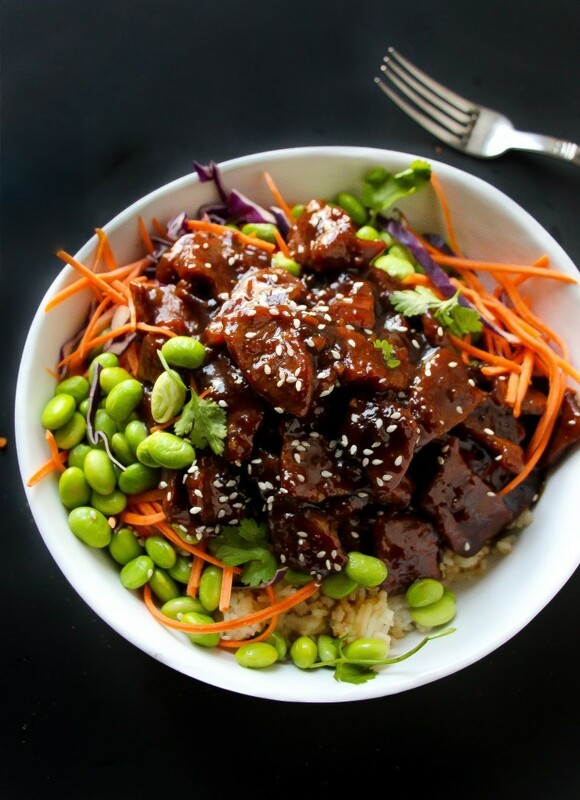 Sprinkle green onions, edamame, and shredded carrots, and toasted sesame seeds over top.